Did the New Day's enforcer feel betrayed by tonight's shocking move? Earlier tonight, it was revealed that the New Day would add a new hip gyrating, pancake tossing big man to their group. With Big E out with an injury, Kofi Kingston and Xavier Woods enlisted the help of Big O, Kevin Owens. SmackDown Live started with a bang tonight, with the Kevin Owens Show. Owens, after taking in the reaction from the Montreal crowd, introduced his guests, The New Day. Sadly, there were only two members, as Big E was out of action. After a few questions, Kevin Owens stated that Kofi Kingston and Xavier Woods would need some help in their tag team match up later on in the night. After going over his qualifications, the WWE Champion and the creator of UpUpDownDown decided that Owens was a perfect fit for their group. Owens, Kingston, and Woods shook their hips all the way to victory later on in the night. It was a huge moment for all three men, although one man may not have been as excited as the rest of them. Though The New Day, featuring Big O, was successful in their debut as a trio, Big E was visually displeased. The former Intercontinental Champion took to Twitter to vent his frustrations with his friends with a simple look of disgust. What does this mean for the trio? 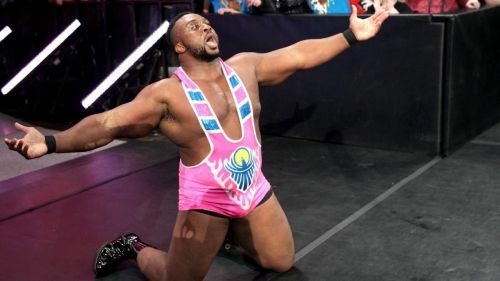 Will Big E have something to say when he returns to SmackDown Live? In all seriousness, this was a lighthearted moment that gave the Montreal fans something they loved. Whether Kevin Owens and the New Day will continue to work together or not is unknown at this point, but we're sure Big E won't hold a grudge.